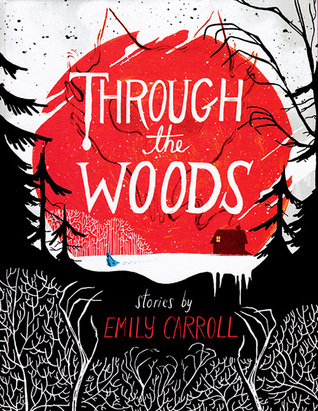 Through the Woods is a collection of five graphic short tales. By graphic, I use the term like in 'graphic novel' - i.e. the tales are illustrated. I would not call these 'comics' - there is a slow and deliberate artistry in the illustrations and text here, and it is, after all, a hard-back book. Some of the stories leave the horror just off-page, so your imagination fills in the blank with bone-chilling effect. Others put the horror very much on the page, so you shudder at the creepy illustrations of creepy ideas. The illustrations use black, white, and red persistently - all other colours are slightly faded, slightly subtle. And one archetypal, universal theme of horror in this book is teeth: whenever we get a close up of teeth, devouring, smiling, fletching, tearing... there are terrible teeth in this book. Oh, these stories are wonderfully, deliciously dark, beautifully written and beautifully illustrated. Five tales, each one a gem, and the book about as perfect as it could be.